With a rumored heritage of Grand Daddy Purple and Durban Poison, Cherry Pie marijuana seeds are an 80% Indica dominant strain, producing dense, hard, colorful buds with a sweet cherry aroma. A beautiful looking plant to cultivate, it grows well both indoors and outside, in warm sunny climates and southerly locations. Considered a moderately easy strain to grow, the plants are stable and feminized, guaranteed to create the highest quality female, from each seed purchased. Its fruity-cherry aroma is evident in both flower and when smoked, together with an unmistakable cherry flavor that dances across the taste buds, making the mouth water for more. 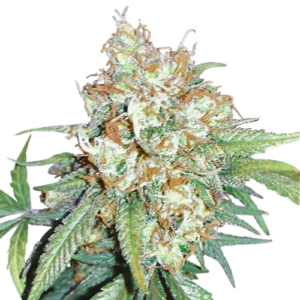 The hardy, Indica characteristics make Cherry Pie a suitable strain for a variety of growing methods and techniques, both outdoors during the season, and within a purpose built area. Growing to around 1.5 meters tall, and with a dense, bushy shape. it’is an ideal candidate for both Screen-of-Green (SCROG) and Sea-of-Green (SOG) growing methods, helping to improve and increase the total, overall harvest. With a good indoor environment and a small amount of care and experience, Cherry Pie marijuana seeds are easy to grow and fast to mature. A regular 12/12 light period is necessary to induce and maintain the flowering process, requiring approximately 8 weeks for the plants to achieve peak ripeness. Planted outdoors, maturity usually occurs towards the end of October, depending upon location. Cherry Pie marijuana plants are good producers, generating approximately 14 ounces of the highest quality, dense, dank buds per square meter when grown indoors. Outdoors, the plants are usually larger, having vegetated over the Spring and early Summer months. Highly recommended for lovers of fruity flavored weed, you can now buy feminized Cherry Pie marijuana seeds in packs of 5, 10 and 20 seeds all sold with stealth shipping and guaranteed germination. Sweet Cherry flavored buds with a wonderful fruity aroma and potent high. A relaxed and happy sensation, that can help to ease stress, anxiety and depression. Highly recommended for lovers of fruity flavored weed. Individual plant yields vary depending upon conditions and climate, but yields average around 14 ounces of good quality buds per seed. With its high THC content of 23%, and low CBD levels, Cherry Pie marijuana is enjoyed by both recreational and medicinal users alike.